Face powders, be they the pressed or loose varieties are used to set your makeup so that they last longer and help prevent creasing or premature disappearing of your foundation during the day. Powders also serves as a quick touch up aid and to reduce shine and oil that accumulates on the skin throughout the day. Too much powdering however, can lead to the cakey look and the product may even settle in fine lines and make make you look worn and tired than refreshed! Mattifying powders and foundations help resolve this problem to an extent but readers, let me tell you of a miracle product I've newly discovered one weekend whilst foundation shopping with a girlfriend that keeps me shine free for 10+hr days - an amazing feat considering the grease ball I become most days in the office. Looks and feels like any other loose translucent powder - it appears as a mirco-fine white powder in the shifter lidded jar but is colourless when brushed onto skin so any skin tone can use this product. Comes in a massive 30g jar and will literally last you forever if you use this exclusively on your face or 1/2 a lifetime if you use it on other parts of your body as well - i'm not kidding. A little goes a long way. Don't think you are getting more mattifying power by applying this stuff all over as you would normal translucent powder, it will leave your skin with a white cast and looking flat and de-void life or luminosity- not a good look really. Apply your normal loose powder as you normally would, and then pick up the tiniest amount of the anti-shine powder with your powder brush (I use a large fluffy powder brush like the MAC #150 brush or Bobbi Brown's Powder brush). and just lightly dust with deft hands on areas you are prone to grease up during the day, T-zone, around the mouth and cheeks. Use a fluffy blending eye brush (eg. MAC 224 or Stila #9 brush) to work on the nooks and crannies of the nose and mouth areas. Update: I now apply this powder before loose powder as there is less of that flat look when I change the order of powder application around. 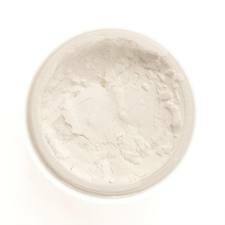 Tip: Apply blush/bronzer/highlighter after this powder liven up the face and avoid the flat look. With zero touch up, my face at 8pm after a long 10 hour working day was still looking very presentable - skin was looking very fresh and hydrated with minimal shine - unreal! Ingredients: imethylimidazolidinone rice starch, talc, parfum. Probably the best mattifying products I've ever used and considering this stuff is used in theatrics and TV, you know it stands up to all the heat and rigour of the stage industry (Kryolan is a theatrics makeup company after all). The bonus is it's cost effective since you probably only ever need to buy a jar of this. The only gripe I have is how flat it can look when freshly applied. I'm thinking of mixing it into the translucent powder to see if that helps with the finish upon initial application - otherwise, this is the savour for anyone who oils up like a grease ball and shines like a beacon of oily light within a few hours. If you couple this with a mattifying primer, you will have the perfect weapon for a shine free face under any circumstances. RRP A$29 for 30gram at selected Kryolan stocklists. For stocklists or other Kryolan product details, please visit Kryolan Online. You're right Amy, this sounds right up my alley :) I really must take a trip to the Kryolan store soon! Brands that are theatrically based always come up with winners. Love the idea of this! You will love this stuff Emily - it is pretty good, especially to use during summer when I get oily even faster. 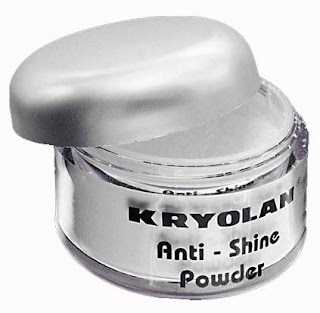 I've tried MAC's anti-shine powder and din't like the whitish residue that has to be blende away...prefer more translucent...may try Kryolan for this.